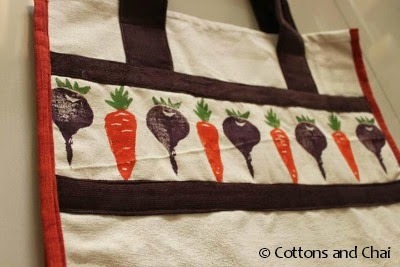 Cottons & Chai: Potato carving and stamping: Spud-tastic fabric prints! 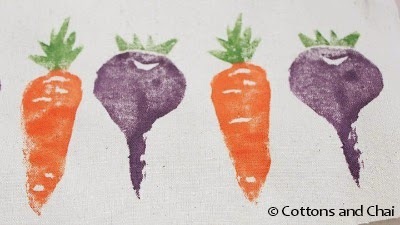 Potato carving and stamping: Spud-tastic fabric prints! As I sit here looking out of the window, I see the leaves already turning color and realize summer is quickly slipping through our fingers here in Minneapolis. I shudder when I think of the warm welcome (-40 degrees) we received when we arrived here in January. You can imagine how crazily happy we are at the moment to bask in the hot sun. One of my fondest memories of our first Minneapolis summer was being able to step out of the house.... and walk down the street... for more than 30 secs....without getting a single frostbitten ear! But the cold is still some time away and I want to revel in what's left of the glorius, glorius summer filled with countless lakes, trails and picnics. And of course, the vibrant, bustling farmers' markets - the mounds of fresh veggies and produce. Another of my fondest memories was going strawberry picking with my friends and family. So in celebration of the spectacular season, here's a way to create your own little piece of summer. 1) Take a couple of longish potatoes and a couple that are smaller. 2) Slice them in half lengthwise. 3) Draw a rough outline of the vegetable/ fruit you'd like to print. 4) Take a small, sharp knife and go around the edge of the outline about 1/2" deep. Then, carefully slice horizontally from the outside in until you reach the vertical cuts you'd made earlier and then just lift up the piece. You don't have to super precise - but the basic idea is to get a clear edge of a motif that is at a higher level than the rest of the potato to make a stamp. 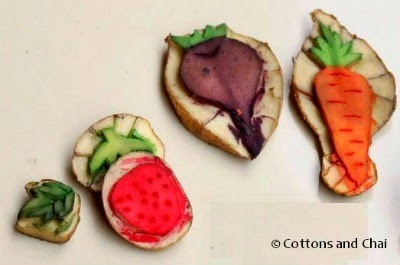 When I did this a couple of years of ago, I'd made stamps of a strawberry, carrot and radish. Notice how you have options to either carve the whole picture on a single spud (as in the carrot and radish) - in this case, you will have to paint the stamp sections separately with a paintbrush. I opted to make separate sections for the strawberry fruit, stem and leaf, just to be able to dip it in a single pile of color at a time and to have more control over print placement. I used fabric colors since that's what I wanted to print on. 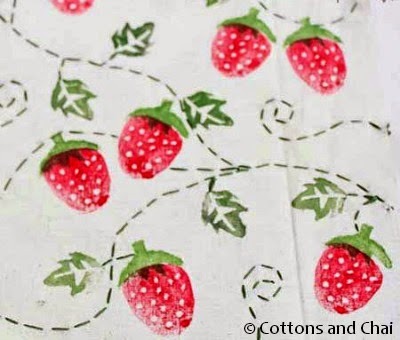 I decided to stamp the strawberries in a little rustic-looking patch. Then to connect them I used moss green embroidery floss to make a running stitch by hand. The carrot and radish I stamped alternately on a strip of fabric I had leftover from some other project. 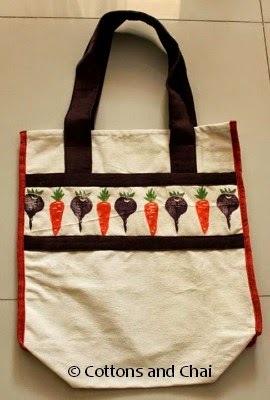 I used the strip to make a sturdy ol' market tote, great for filling up with all that fresh farmers' market produce! Potato Carving! Wow!!! You make it seem so easy, I am so tempted to try it myself. Priti - Sure, give it a go.. you'll be amazed how simple it really is!